COME AND STAY AT THIS 3 BEDROOM, 2 BATHROOM COTTAGE. 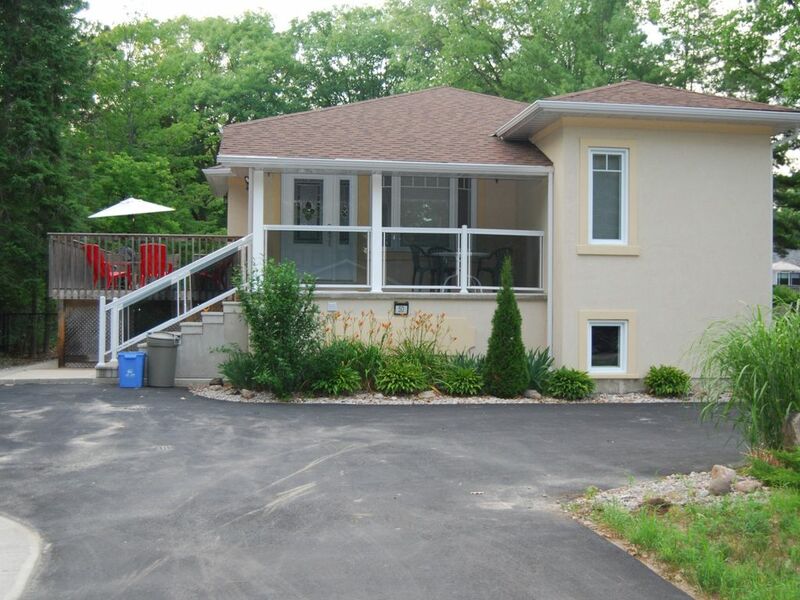 CLOSE TO COLLINGWOOD SKIING, CLOSE TO ALL AMENITIES AND NEAR BEACH AREA 4. 3 bedrooms 2 bathrooms ensuite in masters bedroom. 2 queen size beds one bunk and a single bed..
last cottage at the end of a quiet street. there is a path along the side of the cottage that takes less than 2 minutes to the beach. gated backyard with a fire pit. Veranda at the front, beautiful landscape. 10 minutes to the main drag. 15 minutes to the blue mountains in Collingwood. The small community of Wasaga Beach along the Nottawasaga Bay in the Georgian Bay, 1.5 hours north of Toronto, is known largely for its spectacular shoreline. Dubbed the longest freshwater beach in the world, the sands are credited to Ice Age glaciers that melted, leaving an astounding 14 km (9 mi) shoreline. In 1934, Wasaga Beach was made famous when the first Canadian overseas flight took off from its sandy runway. The relatively quiet community sheds its reputation during the summer as visitors flock in search of fun, sun and sand. Winterâ? ?s blanket of snow is welcomed by cross country skiers and snowmobile enthusiasts. As well, the shoulder seasons of spring and summer provide visitors with tranquil stargazing moments, serene beach walks and off-season value on accommodations. When in the area, a trip to the Nancy Island Historic Site is worthwhile. This island located on Nottawasaga River was amazingly formed by the silt deposits of the sunken Schooner Nancy, a British supply ship in the War of 1812.